Our County Wall Maps combine landownership detail contained within the plat book to provide an entire view of the county. These large maps include highways, roads, townships, section numbers, range numbers and other geographic features. 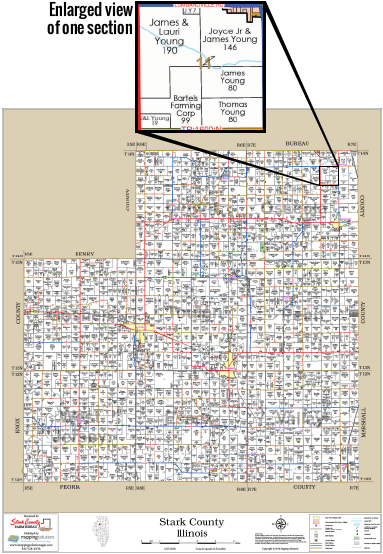 Property boundaries, landowner names or initials and acreage information are shown for the rural areas. We also produce other maps, such as School Districts, Fire Districts and Aerial Views in a Wall Map version as well as Custom Maps with all of the information you need. Call now for a free estimate to see how we can design just the right Custom Map for you. Map size is typically 36" X 48" but can vary depending on the size and shape of the county. We offer two types of paper for our wall maps, Standard and Premium. Standard Wall Maps are printed in color on heavy 32 lb. High Resolution Coated Bond paper for durability and appearance. Premium Wall Maps are printed in color on 90 lb. Premium Photo Matte paper. This low-glare, professional grade photo paper provides outstanding clarity and a long lasting image for your wall map.